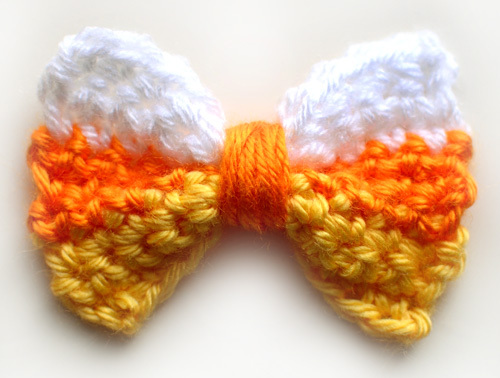 In the spirit of Halloween, here is a bow pattern that is made with candy corn colors: yellow, orange, and white. Attach the bow to a headband or glue on a barrette or hair clip for an easy accessory. You can even use it to adorn a hat or bag. 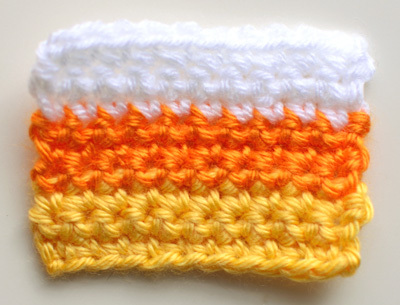 However you decide to use it, be sure to crochet a few to give away to family and friends. Repeat row 2, 1 more time. Change to orange, repeat row 2, 3 more times. Change to white, repeat row 2, 3 more times. Finish off. 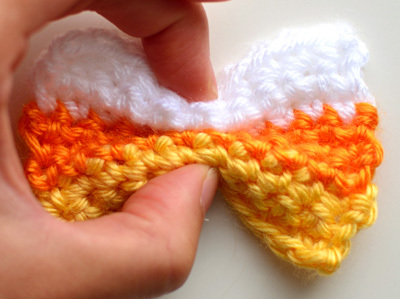 The crocheted bow will look like a rectangle. Pinch the center of the rectangle together to create the bow shape. Wrap a scrap of yarn, about 20 times, around the center of the bow. Tie and secure the ends of the yarn on the back side of the bow. 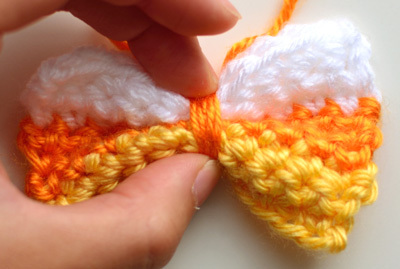 Need help while crocheting your bow? Leave your questions below! This entry was posted on Wednesday, September 13th, 2017 at 10:51 AM by Rachel Choi	and is filed under Free Crochet Patterns. You can follow any responses to this entry through the RSS 2.0 feed. You can skip to the end and leave a response. Pinging is currently not allowed.